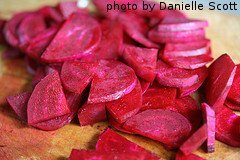 Beet Varieties - What's the Difference? 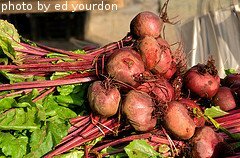 There are lots of different beet varieties available to the backyard vegetable gardener. These varieties can vary quite a bit in size, color and shape. In addition, some varieties are grown more for their tops, while others are grown for their roots. We suggest planting a couple of different varieties every year until you find some that you really like. In addition, choose varieties that mature at different times. 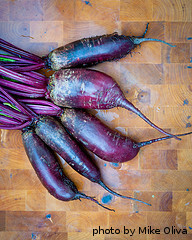 That way, you can plant once and enjoy your beets over a few weeks. 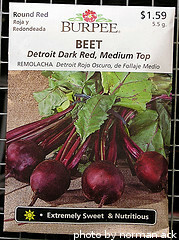 You can get beet seeds at most garden centers or order them online. Here are some common beet varieties and a little bit of info about each one. Please note, the number of days to maturity is counted after the seeds have germinated and for average-sized roots. If you want larger roots, you'll need to leave them in the ground another couple of weeks. 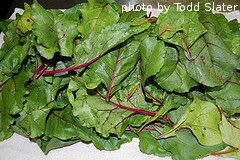 Cylindra - This beet variety produces long beets that are good for slicing and canning or pickling, beets average 7-8" long and less than 2" across, ready in 64 days, tops average 9"